The electronic absorption spectra of 2-(2,4-dihydroxyphen-1-ylazo)-thiazole (H2L) in organic solvents of different polarities and aqueous buffer solutions of varying pH values were investigated and discussed in relation to the molecular structure. The potentiality of H2L as new chromogenic reagent for the spectrophotometric determination of Mn(II), Fe(II), Co(II), Ni(II) and Cu(II) was studied by extensive investigation of the optimum conditions favouring the formation of the colored complexes. Beer's law is obeyed up to 3.30, 2.79, 4.13, 5.28 and 5.05 mg mL-1 for Mn(II), Fe(II), Co(II), Ni(II) and Cu(II) respectively. The standard deviations of the proposed method are 0.0003, 0.0007, 0.0008, 0.0005 and 0.0005. The molar absorptivities are 1.75 x 104, 1.96 x 104, 2.83 x 104, 2.73 x 104 and 2.28 x 104 l. mol-1 cm-1, whereas the Sandell sensitivities are found to be 0.0031, 0.0029, 0.0021, 0.0022 and 0.0028 mg cm-2. 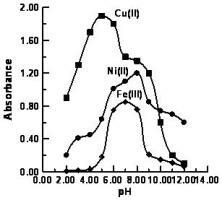 The effect of interfering ions on the determination of Mn(II), Fe(II), Co(II), Ni(II) and Cu(II) was investigated. The proposed method was applied to determination of the mentioned metal ions in rice grains with high precession and good accuracy. The solid complexes were prepared and characterized by using various physico-chemical methods viz. elemental analysis, molar conductance, IR, UV-Visible, ESR, mass spectra and magnetic susceptibility. All the obtained data reveal the formation of the metal complexes through the donor sites of one N-atom of the azo group and O-atom of the hydroxyl group in o-position.